Home Q&A Wednesday	Q&A Wednesday: I’m Not Gonna Make It Through Labor Day! Q&A Wednesday: I’m Not Gonna Make It Through Labor Day! Trying to eat clean through a holiday? Is it even possible? YES! Q: Labor Day is approaching, there will be end of summer bbq’s and cocktails. 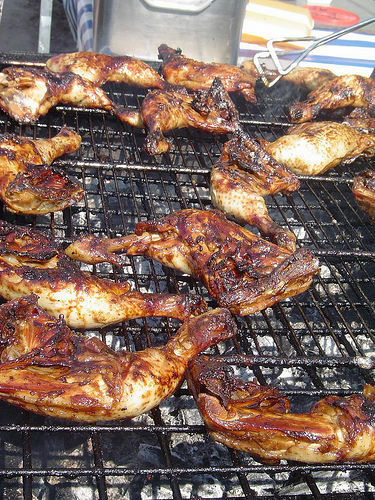 Since we are eating clean, what is your advice on choosing what to eat and drink at these bbq’s? I’d rather deal with Bebe’s Kids than deal with BBQ food and people all in my plate. It’s that deep, y’all. But for someone who actually wants to enjoy themselves and have a little food and some good drinks, I do have a few tips that – while they aren’t the “cleanest” of eating tips, they can certainly ensure that you won’t eat as much as you normally might and you will still manage to enjoy yourself. Keep a glass of water on you at all times. Why? Firstly, water actually helps you fill up. Drinking water while you eat slows you down, and gives your body time to process the fact that food is being put into it. Since it takes your mind approximately 20 minutes to realize that your body is full, taking time to slow down and drink water (a vital part in weight loss, anyhow) will give your body time to realize what’s being put inside of it, and how much. Besides, you know what the alternative can do to you. Portions, portions, portions! I know that Aunt Pookie (hey, I love my Aunt Pookie) has the world’s best scalloped potatoes, and I know that you love ’em and all, but commit yourself to portion sizes no larger than the palm of your hand. Put the satellite dish-sized plate down. I’m serious. You know y’all have those Thanksgiving-specific plates that are large enough to double as someone’s rims. Don’t do it to yourself. Stick to a regular sized plate, palm-sized portions, and allow yourself to try a bunch of different things… not simply overdoing it on the few things you love. Leave the obviously-store-bought-stuff… alone. I jokingly asked this question on twitter, but I’m serious. Those store-bought pies, those boxed mashed potato flakes, the scalloped potatoes that come from the Betty Crocker magic elixir? Leave it alone. Why? Foods that are processed are, well, processed – genetically engineered to be easier to chew, not leave food in your teeth, or “fill you up.” Unfortunately, it only turns back into the same powder it originated from, with all the calories and none of the “full” feeling… leaving you not only still hungry after all those calories, but on a carb high, at that. That wonderful “melt in your mouth” feeling that M&Ms has convinced us is a good thing? It might be wonderful for chocolate… really not ideal when it comes to actual food. Now, aside from some other basics (limit the “creamy,” “unnecessarily greasy,” “fried,” ridiculously sugary” and my favorite category – “hellasalty”), there is one final important thing. Remember – you don’t go to a barbecue to agonize over eating clean. You go to enjoy yourself… not overindulge and then guilt yourself about overindulging! The food makes an outing more pleasurable, but agony certainly can and will ruin it for you. If you manage to keep the basics in mind and still listen to your body, you’ll find that you enjoy yourself more and not ruin your clean eating. And if you try and it doesn’t work out completely? Take it as a learning experience… and think about how you can do better next time. Do not guilt yourself. You might even get there and realize that the stuff that’s there isn’t even appealing to you anymore… quite a way to surprise yourself this holiday, no? What clean eating tips do you have to get through your Labor Day? What foods do you struggle to avoid during the hlidays? Let’s hear it! Thank You Doll! 🙂 It’s all about portion control. I’m gonna try this Seltzer Water crap..lol. Not sure how good it’s gonna taste with my Grey Goose or Patron, but we shall see. I will also throw some fruit in it too. I already know people are gonna be talking about me at the bbq, but I really do not care. They can pound sand. Seltzer water with a splash of lemon or lime w/ some Ciroc or Grey Goose is fab… The fancy name for it is Vodka Gimlet. Their are only about 145 calories in this lovely drink… Try it and enjoy! I’m serious, it’s too tempting! The best way I’ve found to getting through this sort of thing is to make and bring something ahead of time that I know I can eat according to my clean eating plan. A giant vegetable or fruit salad, a lean protein dish, etc. That way, I know that I have at least one thing that I can load up on and still have a full plate, while leaving a smidgen of room for the other food. The other thing: resisting the urge to graze (a.k.a. prepare a plate of food, eat a plate of food, be comfortably full, and then spend the rest of the time picking at the food table “because it’s there.”). Bringing a game (cards, horseshoes, anything) can help take the mind away from it! Bring something you can eat guilt-free. That way, something is on the plate, and both you and the nosey observers are satisfied. I know I’m extra late with my post, but I guess some folks are going to different barbecues than I am. Barbecues can be ultra healthy, pleasurable meals! Use really interesting spices to jazz it up – like cumin or tarragon, and really go for it. A barbecue can be a very healthy lifestyle-friendly affair, and no one cares if you bring your own meat or veggies to grill. My mom once brought asparagus to my house to throw on the grill, and that was the first time I had grilled it, and now it’s a staple! last year i would have said this would be hard to do, but after attending a few cookouts i’ve mastered it! Water is number 1, if you are going to sip a drink, I limit it to one and sip, right after that i have water. i munch on fruit is provided while good is being grilled. If whoever is grilling is nice i’ll ask them to cut the salt on my burger. I’ll have one with half the bread bun, and mustard. If they have things like pasta salad. I’ll have one spoonful the serving spoon, most importantly i dont go throwing the whole buffet on my plate. I dont do the hotdogs anymore, no sausages. I have a little of this and that, but you have to remember to eat veggies when possible, fruit, and still drink the water. I tend to think of “feast days” as a minor break from the norm, and then you get back-on-track the next day. Besides, someone who is in the habit of small portions and healthy eating is probably going to take different amounts and balance towards different foods than someone on the stereotypical American diet. I do think it is a bit rude to come to a sit-down meal and eat nothing but carrot sticks because you’re on a crash-diet. It’s easier to get away with at a mingling event. It’s not rude to avoid certain foods because they violently disrupt your well-being. Being vegetarian or having a religion that messes with your food choices is okay, but it’s a lot easier if you’re part of a mainstream movement.